Whaddup, FOO? Feng Shui a room in 6 easy ways! I'm a mutt and proud of it: I'm half Spanish and half Malaysian (ethnically Chinese) for those of you who don't already know me. I was born in the year of the dog in the Chinese zodiac -pretty ironic if I do say so myself. When I was younger I felt more connected to the Spanish side of my heritage. At home we often ate Mediterranean food and my parents spoke in Spanish to each other. Summers were often spent in the south of Spain visiting my father's side of the family. My recent passion for all things yoga revamped an old curiosity I've had for my mother's culture including the practice of Feng Shui (pronounced Fung Shway). Feng Shui is an ancient Chinese practice based on the idea that our living spaces are a mirror of what is happening inside us. It is used in home design and decor to align your environment with who you are and where you want to go. It is also used to ward off negative energies that can affect your life #goodvibesonly. I remember my mother often making references to it as a child saying things like "you should never place a mirror near sleeping quarters" and "never place a desk where your back is facing a doorway". Have you watched The Ring? That crap is scary! I remember the serious looks she would give when emphasizing these basic Feng Shui rules, and I knew she didn't brush it off as superstition. Now that we are building our dream home with Artisan Signature Homes (Instagram: @artisansignaturehomes), one of the spaces I'm most thrilled about designing is a home yoga studio. I recently purchased two Foo Dogs to guard the room and I'm planning on incorporating other Feng Shui principles to the design. Is there a place you typically practice at home? If you don't have one, I highly recommend you create a quiet space for you. 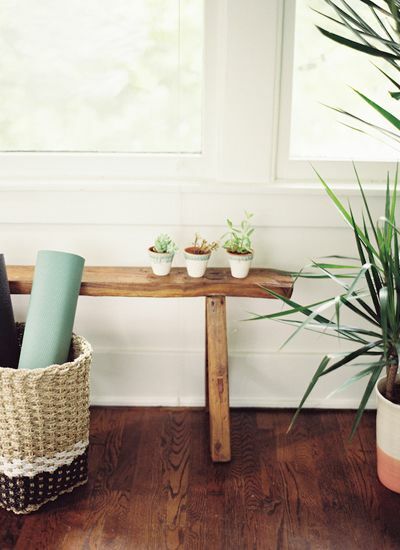 It doesn't have to be a lot of space (enough for you and your mat)and you can incorporate these principles to maximize and align yourself with the space! So, here are six easy way to send the good vibes straight to you. Cuz hey, we're in charge of our own happiness, right? #1 Cleanliness is Godliness: Get rid of clutter. I like to call it "wall acne". Clutter adds stress and thats the opposite of what you want in your zen space. "A cluttered space is a cluttered mind" -straight out of the lips of my momma. And momma is always right. #2 Arrange yourself so you are facing the door: This is just as much common sense as it is Feng Shui. You should always be able to see anyone entering or leaving the room. This way, nobody can startle you. Also, having your back facing the door signifies turning your back on opportunities and blessings -#blessed. #3 Good Ventilation is Key: Having a well-ventilated space allows for the flow of Chi (energy), or Qi. Also, this is common sense when you're practice yoga; you need oxygen to properly tie breath to movement. You'd be surprised how many studios do NOT practice this -probably one of my biggest pet peeves! #4 Avoid poison arrows: There are two very basic types of energy in Feng Shui. Namely, sheng chi (positive energy) and shar chi (harmful energy). Poison arrows are sources of negative energy that emanate from anything sharply pointing toward a main door, your body, or your home. These often occur at T-intersections where a road terminates directly in front of a house. It can also come from sharp corners of walls or furniture. In Feng Shui belief, these poison arrows can negatively impact your life in the form of illness, loss of opportunity financially, and other negative ways. Another way to address a poison arrow is to block the energy at the door or opening to the room. In my new studio, a hallway leads directly to the entrance of the studio. This is a classic poison arrow in design; however, I will have a set of Foo Dogs guarding the entrance to the studio. Side note: Foo Dogs are Chinese guardian lions that resemble dogs which is how they got their western name. The Chinese refer to them as shi (which means lion). They are placed inside or outside a building to protect from negative energy and were traditionally placed at the entrance of Buddhist temples. "Foo", means blessing and prosperity so they are quite literally good luck dogs. Plus, they look like my beloved pug, Piper, so its really two birds..er... dogs with one stone for me. Haha. #5 Keep your windows clean: In Feng Shui, windows signify our eyes to the world. Especially as yogis, we want to be able to experience all the universe has to offer us. If you've ever practiced Om, the sound of the universe, then you know exactly what I mean, and who doesn't love clean windows? #6 Add a plant, but don't kill it! Ok I have to admit here, I don't have a green thumb. In fact, I should be considered the grim reaper of botany; however, if you're better than me, add some greenery to the room. Healthy plants symbolize prosperity and good fortune. But here's the caveat; don't kill the plant and just let it sit there dried up. Furthermore, don't leave dusty artificial plants in the room. The plants represent life force and leaving a dead, dying plant, is definitely not the vibes you're trying to emulate in this space. Need I say more? Well there you have it. Now that you know how to boost your sheng chi (positive energy), you really can't look at these things the same ever again. It's like a really bad chain letter that you don't believe but you just send off anyway because hey, better safe than sorry! How PDA (Public Display of Asana) became the new PDA. And, why you should support it.